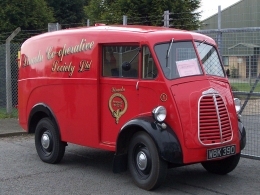 This (Portsmouth registered) van was bought by Lincolnshire Co-operative Society Ltd on 2 August 1994 and restored by their Transport Department, representing many similar vehicles operated by the company during the 1950s & 60s. Since being renovated WBK 390 has been to several vintage vehicle shows and was out on public display with the Morris Minor Van from the Lincolnshire Vintage Vehicle Society at the Co-operative Congress held at the Lawns in Lincoln in May 1998. It won first prize in the Mayor's Parade in 1998. During 2011, the three Co-op vans in the Museum's collection were on display at a number of events marking the Lincolnshire Co-operative's 150th anniversary.